Why is it so hard for many of us to accept the bodies that we have been given? Why can't we just look in the mirror without a snarl or snigger, prod or poke and applaud who we are? What's so wrong about loving certain parts of our bodies that some may call flaws or imperfections? After all, we are all unique human beings anyway, so what's up with looking different? So many people are resorting to comestic surgery in order to enhance their beautiful body, but enhancing is not always the end result. I'm not debating the fact that some people have illnesses/diseases that require some type of restorative or cosmetic surgery but rather I'm talking about the people who have no qualms about going under the knife when nothing is physically wrong with them. The bigger the breasts the more attention a girl gets. The larger the 'pects' the more masculine a man is perceived to be, you know exactly what I mean. Remember all the saga about the french company Poly Implant Prothese (PIP) who sold breast implants which contained industrial grade silicone rather than the medical grade? Only now are we finding out how there was an increased risk of this product rupturing in the body. This same french company has apparently also sold many of these implants to men who wanted to enhance their masculine look. You need only search the internet to check these facts. For the sake of beauty many lives have been lost. You can suffer loss of sensation, nerve damage, infections, allergic reactions, heart attacks, blood clots, physical scarring and many other complications. Now these same patients are being left in a far worse condition with an added cost and element of risk to remove or replace them. Should we not concentrate more on getting to know the character and personality of others, rather than basing our whole perception of them on how they look? Could this lie at the root of the failure of many personal relationships? We already know how much we are manipulated via the media, how photos are doctored using colour to make our skins lighter or darker, how we are made to look thinner or more shapely than we actually are. How a bald person can be made to look as if they have a full head of hair. The list is endless. There is one point that I have been thinking about for a while. You can cosmetically change nearly every part of your body to make yourself feel great. But if you are still that loud mouthed uncontrollable witch with no sympathy, empathy, no heart, then you are still exactly the same person you were before. You see, old problems and baggage won't go away unless you deal with them and no surgeon's knife will change that fact. You see, I'm not perfect looking. I should have looked after my body more as I was growing up, so there are bits n pieces that don't exactly fall in the right place. I loathe it, but surgery's 'not for me'. First I need to deal with my inner perception of myself and at the same time, work on the outside with a healthy diet and exercise. Should it matter whether others find me handsome or attractive? Surely the important thing is having confidence in my own body and being comfortable in my own skin. 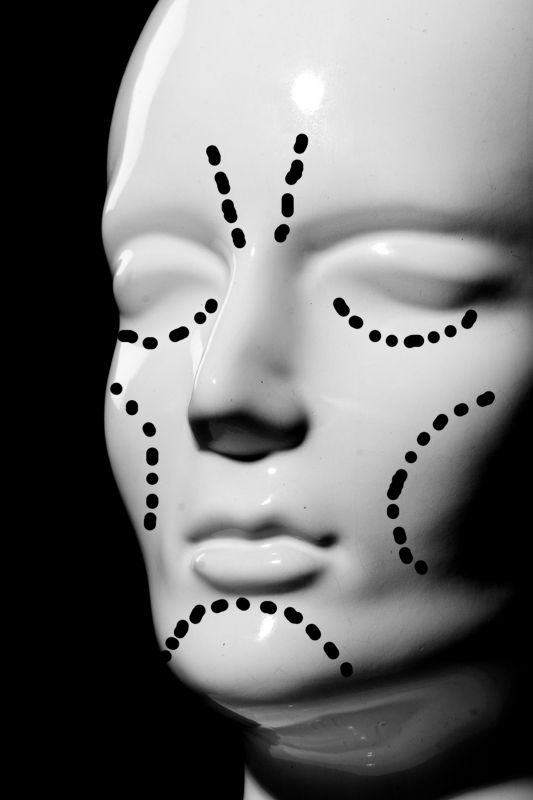 Can cosmetic surgery ever be a solution? You are welcome to share your thoughts, experiences and struggles. Thanks Melody. I totally agree with you, and fully on board about 'freeing up the operating rooms for those who need it' especially with so much pressure being put on the hospitals these days. If you do think of any other points then please feel free to add, as it also may give others suggestions, hope or encouragement as well. I think that a lot of this is driven by media-inspired definitions of "beauty". If you don't match up, you're a nobody. It's an insidious message that attacks a person's self-esteem. And it isn't easy to sidestep the message. We need a counter-message, one that values people for who they are, not what they look like. That's just it. There is a huge industry which has increasingly come to depend upon making us feel inadequate in order to market their products. Their advertising harnesses sophisticated psychological techniques which create messages most people are not equipped to deconstruct. Contented people simply don't consume nearly as much as those with a 'hungry ghost' - so in every area of life we are encouraged to remain dissatisfied - even with our own selves. Jesus encouraged us to consider the lilies of the field which in their simplicity were arrayed with a greater splendour than king Solomon's. There is something attractive about a person who is grounded in themselves and comfortable with who they are. Just being around them can have a settling influence. But the current climate makes this goal hard to achieve. Rum's comments also remind me of how he told us not to focus so much on the outside,but to look within. Clean the inside of the cup, he said, and the outside will be ok too. Interesting how some observations from 2000 years ago can be so relevant in the climate of this post-post-modern society. Thanks Dennis. Yes, the media does have a lot to answer for. If only people would take a really good look around them each day, and they will see that we don't all look like how we are portrayed on TV, magazines etc. Adele the singer, a larger woman, has managed to make it by using her real voice and not conforming to the standard requirements (so far, but don't know if she has ever had surgery) so she is a good example that big is not always a bad thing. Very well said Shiloh, thank you for commenting. We need to look at the inside and not focus our entire being on the outside. I totally agree! Beauty is everything, real soul and character is worthless in this society! I want to be remembered as a loving, caring person (and hopefully a great writer! lol) when I die. I would never go under the knife, it just seems wrong to me. Thanks Jade, I hope we can all be remembered for something good other than our looks, and I'm sure you will be a good writer, if you aren't already! Beauty is in the eye of the beholder. The vast majority of the so-called images of beauty we are force-fed by the media are digitally remastered or airbrushed; they are only an illusion. We see what we want to see in the mirror, and if we don't love ourselves first, we're not likely to be pleased by our own reflections. Physical beauty is only skin deep. Kris, I like the first sentence you wrote, because we don't all believe the same people are attractive looking, so it is in the 'eye of the beholder'. I also think that many people are trying to achieve an impossible look with surgery because I don't think any surgeon could achieve what an airbrushed picture does. So it's like a vicious circle of surgery being done to obtain an impossible concept of 'perfection'. I'm eating right, exercising and aging gracefully. In just a few years from now I will be a senior citizen and I'm okay with how I look. There's no way I will ever consider going the plastic surgery and/or botox route. Those who don't know how to see beyond the skin level are blind to true beauty. Timethief, you have a good point here in doing exercise and eating right. That's the core of our health regardless. Thanks for your comment. I mean that one of "Why is it so hard for many of us to accept the bodies that we have been given?" One thing we are born with, is the desire to be liked, I am not shrink, but I think it is a side effect of our insecurity, if we are liked we are part of the herd and we are safe as in a shoal of fish. Also there is the need to seduce. I think we are born "seducers". Again it is so because it gives us a sense of security. From this, to convince us, through the right propaganda and the coercing of media, added to the new ways society is developing, pointing to younger and younger audiences, that we can only get our aims if we are and do "whatever it is in the fad", there is only a step. You see, middle of the road, and older people are more difficult to convince (Oh yes, there are exception, of course), because they come from a different platform of education. Some years ago, not many, plastic surgery was only for women, now we are in a tossed salad of all genres and ages. It starts with piercing and tattooing and after that the "correction" of our deviation from the ideal. This is the reaction of the pack, the herd sense. And it is stronger the younger you are. There is no individual conscience of the dangers. This is my answer to your question. As I always write, not the holy truth, only what I think are the undercurrents that move our society. I could see it everywhere in the world, but it starts in the Western countries, where the freedom of youngsters is first felt at early age, and then there is a kind of hauling and dragging of older generations that in their loneliness (another cause of our time) seem to feel stronger the "need" of belonging. About myself, I do not think I would go under the pressure, whatever the future reserve for my looking, firstly because my body is so afraid of anything that cut, if it is a shave blade or an scalpel, that it will react in a freaky way if I only suggest to undergo a surgery, and secondly, because I would not think about that in any way. "I am the best, the only one, there is no other better than me"
If you can hold your gaze for more than fifteen seconds without bursting out in a peal of laugh and guffaw, your self-esteem is in good health! Thank you for these little puzzle pieces you create and make us think (and look around) a little deeper (and wider) than in the ordinary way! You're right Untony, nobody likes to be disliked but not everyone understands that beauty will not change this if you have a bad personality/character. You raised a good point about 'education'. Despite the media etc, I feel that maybe parents need to spend much more time bringing up their own children and nurturing them to love who they are regardless to their looks. Media may still sway some, but many more will be comfortable in their own skins. The earliest influences begin at home. If we could think plastic perfection just another way to wear something that makes you feel (and look) better- may be this isn't a bad thing! Some profession could take advantage of that- so why not? If you could afford and this 'putting under knife' makes you happy, doesn't matter! But, when someone having that risk of losing everything in long run- their mistake, deadly mistake is that! Poor choice! And that of- a nice looking person never become a nice person with having ugly mind and character- is just the truth will be there forever! Cosmetic surgery is an expensive shortcut to popularity. Looks are overrated. At any rate our children will bear our genes and betray our real genetic makeup anyway! What's to hide? Oh yes, great angle here, getting rid of one of the family genes that makes us look so different and unique. As a thought, it just might put pressure on one family member to have surgery if all the other members look a certain way. Thanks for getting me thinking here Untonyto. I don't think I'll ever do plastic surgery, but if I see things beginning to bloat and sag, I do work out to remedy that. I try to keep a certain standard of making my body look decent without resorting to extraordinary measures. You can look fantastic with just good diet and exercise habits, if you can just make yourself do it. Sometimes I can, sometimes, I'm lazy until I can get motivated again. Yes, good exercise and diet can work wonders if you stick to it. Working on what's inside is also very important. Thanks Cindy. For this subject I'm quoting one of my favourite songs from which I've written a little same type of a post 'the superficial world' ages ago, but here's the quote; "Look in my eyes n' I'll make you see, we're drifting aimlessly in this world of make belief.....The images they sell are illusion and dream, in other words dishonesty". So I do think media has it's effect on how we think we "should look like" even everyone knows that everything we see is manipulated somehow. And it's the cruel truth that people do "rate" each others on how they look and somewhat a lot built thir conception of a person by his/her looks. That's also raising the pressure of looking "perfect." But also that is a fact no one is perfect and we should look under the skin rather than the looks. If more people did and accepted that fact we don't have to look like "perfect" in themselves and in other poeple as well, the world would be wery much better place to be for many people in that case. Thanks Amethyst, and very well said. Perfect, and I agree! I'll never understand what these people are truly trying to achieve, but real beauty comes from the soul. I think everyone and everyone should get cosmetic surgery if they want it. If you have been hating your nose your whole life why should you not be able to spend your money to fix it? That new nose will give you a greater sense of self esteem and you will be happier overall. Of course, I am not talking about people who get something different every year, but things that people genuinely hate about themselves. We all have something we don't like about our bodies. If instead of learning to try and accept ourselves we alter our image by having plastic surgery, especially if it is not just a one-off (example) might this not feed an unhealthy mania? There are people who have had so much surgery that they now look like freaks, I'm talking about 'the wind tunnel effect'. Nice to hear from you Globaljaunt and thanks for commenting. So I'm here with the topic " looks". Well, to be honest I did a surgery ones. I had these big eyebags that I looked older than I was. I wanted a surgery, but I need to prioritize supporting my children in the Philippines. One day, my husband gave me a gift. And it was for my surgery. How happy I was. But I agree with you that we should concentrate more of the inside. But it is good to have both. I am also wearing a fake finger, since I lost half of it when I was three years old. I wrote about it in my blog: joysnotepad.blogspot.com. " The lost that changed our lives". The begginning of my Cinderela story. A quick question Joy, if you don't mind. As we age our skin becomes loose and baggy. Although you had surgery for the bags under your eyes, if they were to return would you do the surgery again? A fake finger? When I've got more time I will definitely have a read of that post too. Sounds very interesting. Thanks for the comment Joy.